When you’re in the soul acquisition business like Tyrone Savage’s Damien (centre) all the lovely ladies gather around in delight. Get ready for a winner-takes-all fiddle battle in a flighty musical steeped with rich imagination. It’s safe to say Tyrone Savage is a wee bit tipsy on theatre. Like the indie icon that he’s become, the actor/director brings a keen eye for style, texture, and design to the images he creates. But whimsical addiction for the emotions roiling underneath elegant surfaces—those are his true gift as a theatremaker. All of this can be easily detected from Chasse-Galerie’s hootenanny introduction to the songsational build to four fiery femme’s fate with destiny on this magical New Year’s Eve in old Montreal. ‘Chasse-Galrie will take you were you want to be,’ insists a line from the pleasurable presentation made up of two shots of make believe, one shot of dinner table folk lore. At the heart of the blissful musical is the wanton desire for love and adventure among Alex (Tess Benger), Uriel (Hunter Cardinal) Michelle (Kat Letwin) and Toba (Shaina Silver-Baird) who finds themselves with more than just cabin fever in their wooded surroundings. And when Damien (Tyrone Savage), a mysterious man with a penchant for low hanging fruit, wanders around to offer them a gift with certain terms and conditions, it’s anyone’s guess where concentrated silliness can drive the story. 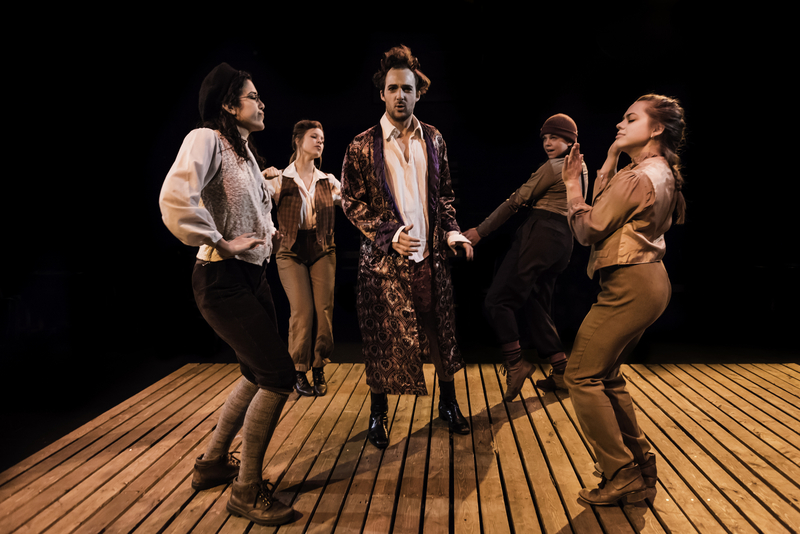 Fast, fun and flirtatious, Chasse-Galerie has the moves like Jagger in a canoe journey of merriment across the sky. If you like your satire on the rocks, the Distillery District staging of this presentation is just what the chilly season needs to warm the spirit.